Hallet Davis Pianos for musical enjoyment for over 100 years. We believe that all children who learned to play the piano – due to either the insistence of parents or to their own initiative – are very happy as adults that they learned to play the piano as a child. Here’s are a couple interesting statistics about piano! If you surveyed 100 adults and asked them if they play the piano – probably under 10% would respond “yes”. If you, however, asked the 90% who said “no” if they would like to be able to play the piano today – almost every single person would say “yes”. This is true – we have tried it! Being able to play the piano for personal or family enjoyment is a very big, secret wish with many, many people. At Hallet, Davis pianos we hope that the information provided in this website will help your secret wish come true – because “Every Life Needs Music”. Most grand pianos available today look very similar – with shiny black finishes, a gold harp and matching brass hardware. Of course Hallet, Davis pianos come in these traditional varieties, but with Hallet, Davis you are offered more variety in styles and finishes than even the largest piano companies. With Hallet, Davis pianos, three qualities are paramount: Performance, Beauty, and Value. Performance – Hallet, Davis pianos are top tier pianos in all ways – from the German engineering designs and highest quality hammers – to the precise, consistent touch of the finely tuned action. The soundboard, the piano’s “speaker”, is made of costly solid spruce – the same material used in the finest acoustic instruments in the world – from concert grand pianos to fine violins and classical guitars. Beautiful and satisfying tone, proper touch and response, and reliable and consistent performance are the qualities demanded by professional musicians. These same qualities are yours with a Hallet, Davis piano. Beauty – Hallet, Davis pianos offer you a choice of exotic walnut or mahogany veneers, in satin or high luster, as well as traditional ebony polish. If a particular piano in your dealer’s showroom hasn’t caught your eye yet, just print out a picture of any Hallet, Davis piano you find here on our website, and take it into your local dealership. 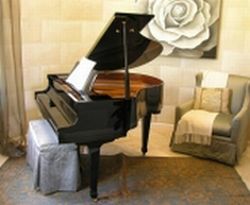 Rest assured that your “dream piano” can easily be ordered and will arrive at your dealership in just a few short weeks. Beyond being a professional musical instrument, your new grand piano is also a piece of fine furniture with tasteful styling, high quality finish, and long-term dependable construction. Friends and family members will rave about the beauty of your new Hallet, Davis piano for years to come. Value – Buying a grand piano is usually a once-in-a-lifetime investment, so buying a good one today will pay off in years to come. Thanks to efficiencies in both labor and production processes, you can purchase a Hallet, Davis piano today for the same or less than you could have purchased a similar piano ten to twenty years ago. And with all of the “high priced” grands in the market, your Hallet, Davis piano could very well end up costing less than half of these other so called “name-brand” pianos. So… in addition to the performance and beauty of these exquisite pianos, the unparalleled value of the Hallet, Davis piano is really what sets our pianos apart from all other pianos on the market today.